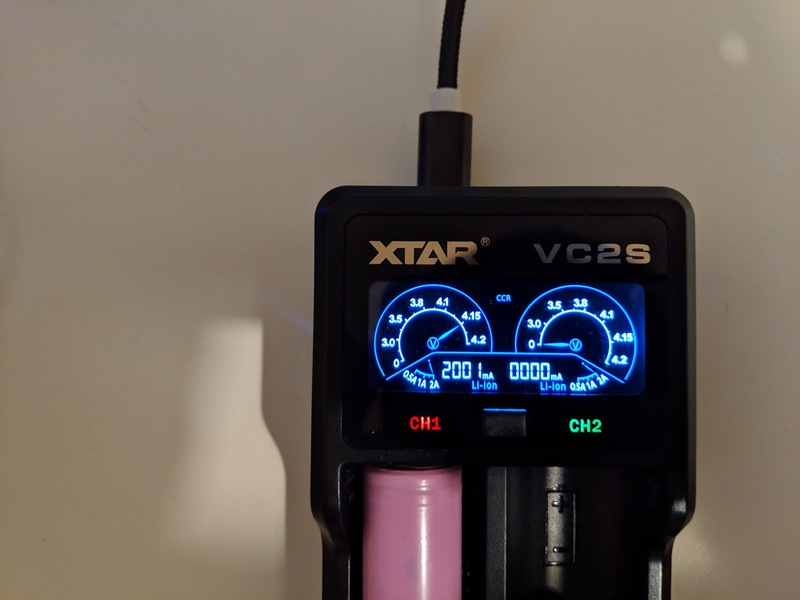 XTAR sent me over their VC2S, one of the newest chargers in their line up, for review. This is a two bay charger powered over micro-USB. 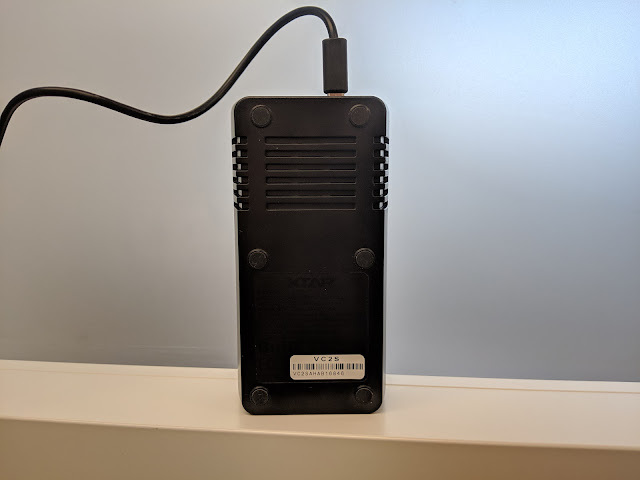 It supports Li-Ion and NiMH chemistries, cells from AAA up to 26650, and has the option to act as a power bank as well. 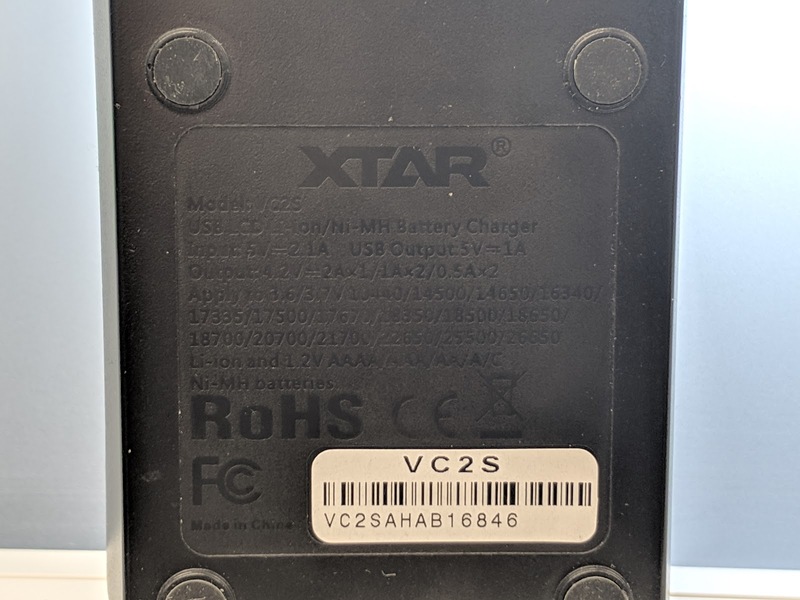 Note that XTAR also has an older VC2. That model wasn't capable of measuring internal resistance of cells, and had a single color display with a lower max charge rate. This charger checks all the boxes for me - it supports both chemistries I use, most cell chemistries I use, and doesn't need any user configuration to do what I want of it. 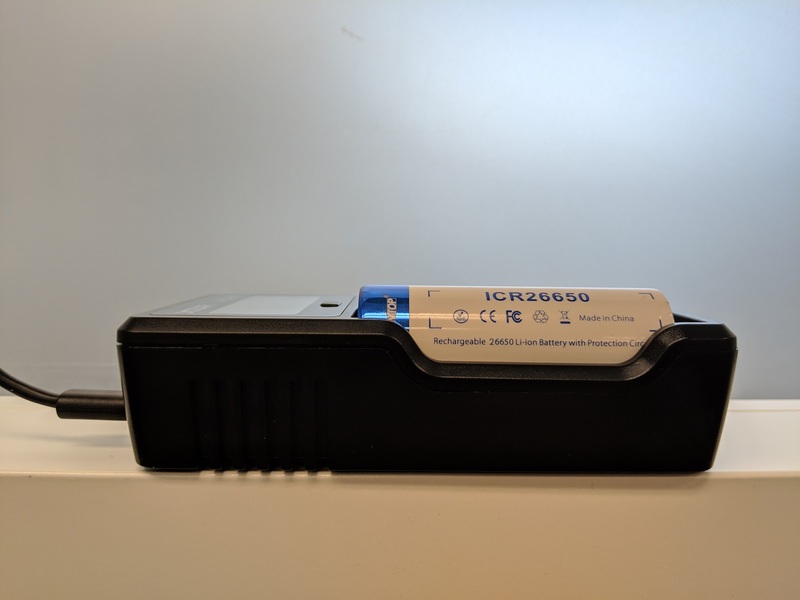 I also like that it uses a common port as an input and can work as a power bank in a pinch, though the form factor doesn't lend itself to use on the go. 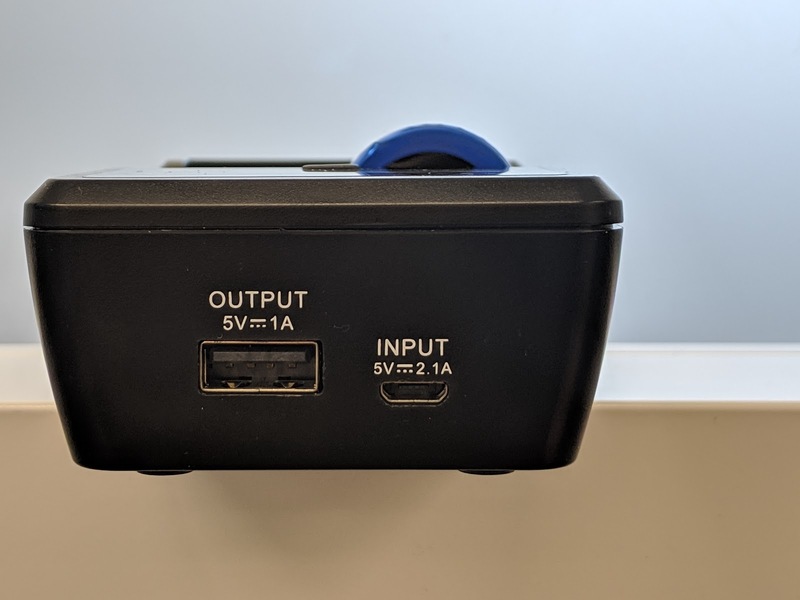 Some users that prefer being able to manually configure tens of settings may find this charger limiting, but it is surely one of my favorites. The charger measures 129 mm by 67 mm by 34 mm. The bays measure 30.5 mm fully closed, and open to 70.8 mm. Like most chargers, this is made of plastic with steel sliders. 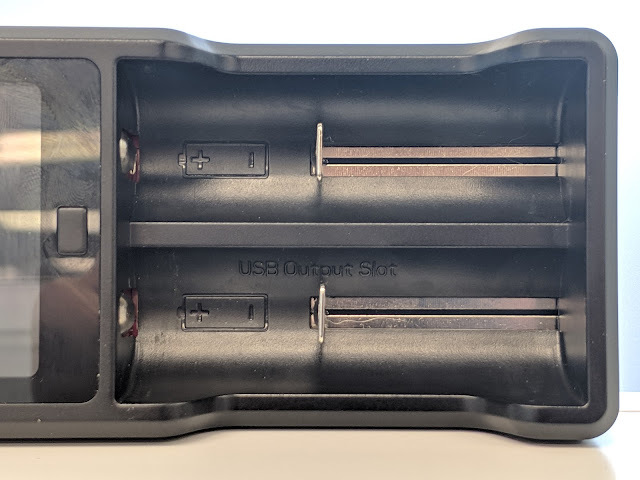 The two bays have the cell polarity molded into them, and the left slot includes a "USB Output Slot" marking. The screen at the top has the single button beneath it, and two bi-color indicating LEDs to show the charge status. The left, right, and bottom of the charger are bare except for a few vents near the top. The top side houses the micro-USB input and USB-A output ports, both silk screened with their ratings. The back of the charger has some more vents for cooling, and a large section molded with all the information about the charger - regulatory, input/output ratings, compatible cells and chemistries, and the brand and model info. There are 6 rubber feet to keep the charger from sliding around. Since the markings are just molded into the black plastic, they can be difficult to read if not well lit. The charger comes in a white box with the charger itself, a micro-USB to USB-A cable, and some paperwork. All the tests below were performed with my Charger Test V1.0 methods, unless otherwise specified. Regardless of the cell being charged, the process is the same and it's very simple. 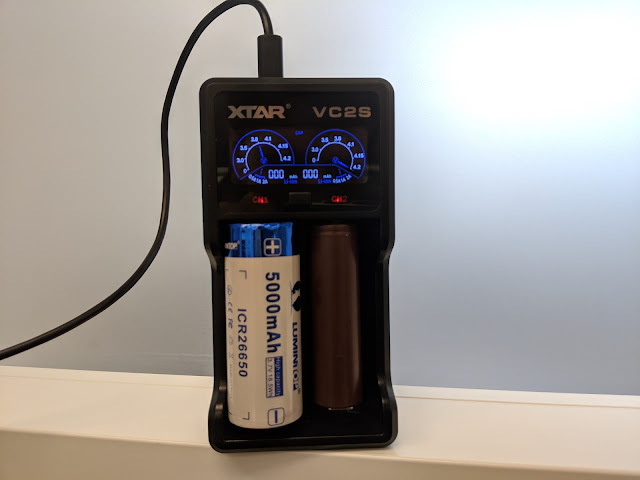 Drop a cell in the charger and it will automatically determine the chemistry, pick an acceptable rate of charge, and start charging. When charging, the LED above the slot will glow red. Once the charge is complete, the LED changes to green. While charging, the display allows you to cycle through showing the capacity that has been charged into the cell, the charge current, and the internal resistance of the cell. The display is cycled by pressing the button, and the backlight can be turned off by holding it. 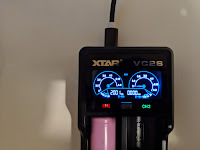 In all display modes, the dial gauges show the voltage of each cell, and the smaller indicators below show the maximum available charge current for that bay. It also shows the chemistry of the cell. Charging a Samsung 30Q cell with my standard setup, the measurement equipment added a fair bit of resistance. This lead the charger to believe the cell was of lower performance, so it chose a lower charge rate of 0.5 A. 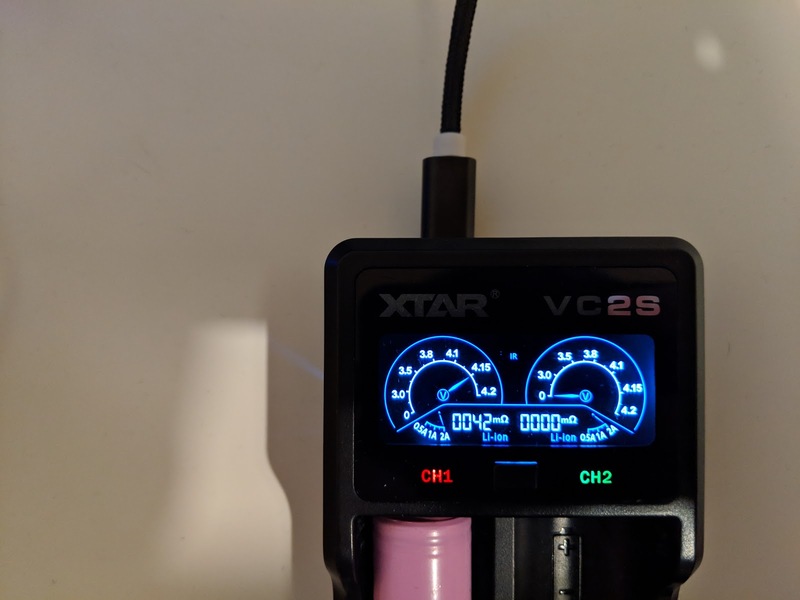 Despite the slower charge, we can see that the charger used a solid CC-CV curve, bringing the cell up to 4.2 V. After resting, the cell charge dropped to a full 4.16 V.
This cell was charged a second time, without the measurement equipment in the circuit. 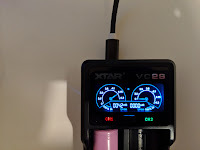 With my tester connected to the USB-in port of the charger instead, we can see that the charger has no issues charging at a faster rate, and that a CC-CV curve is still used. The spikes in current are caused by me turning on the charger screen during the test. Charging an Ikea Ladda NiMH cell also works as expected. The 0.002 A trickle is likely measurement error from my equipment. On this high capacity cell, termination looks to be early as the voltage was still rising, but it may have been timed and charged slowly due to measurement resistance. A lower capacity NiMH cell was tested measuring just the voltage, so no resistance was added to the cell. 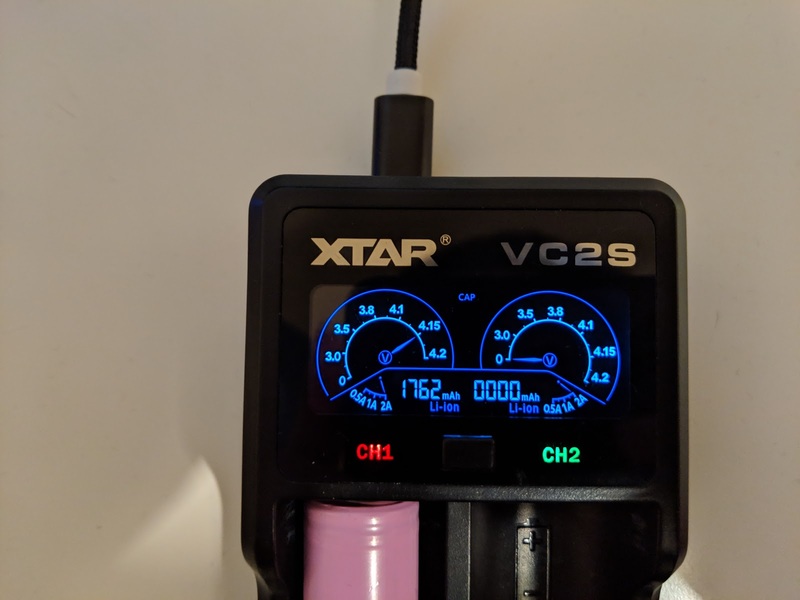 Without the extra resistance added by the test equipment, it's clear to see the charger has no problems terminating when the cell voltage starts to rise. When using the charger as a powerbank, the cell must be inserted and the button pressed to start the charge. 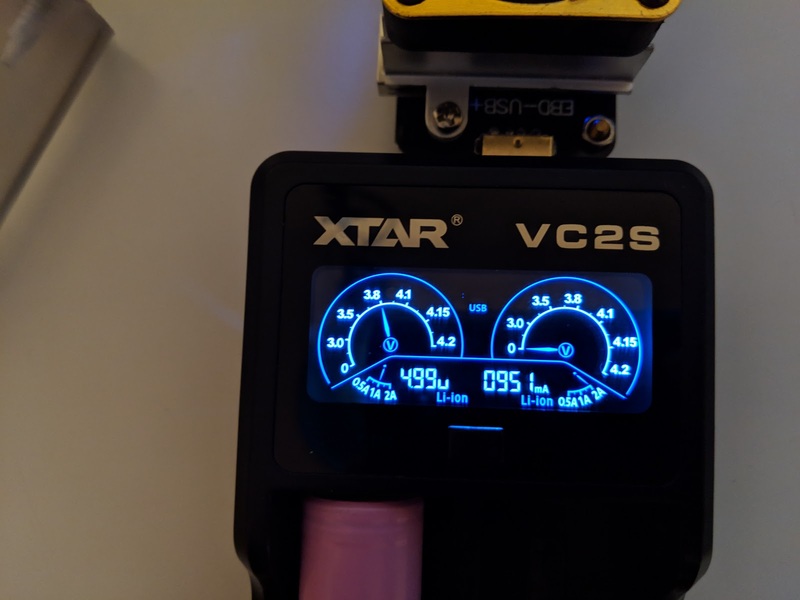 The display will show the voltage of the cell in the dial gauge, and the USB voltage below. The current out is also displayed. The power bank functionality only draws from the left bay, as indicated on the charger itself. This charger is rated to provide a maximum 1.0 A current over the USB-A port. Slowly increasing the current, I found the charger would not begin charging a device over USB unless over 0.2 A was drawn. The charger has no problems delivering the rated 1 A, and didn't cut off until attempting to pull 1.4 A. Slowly dropping the current, the charger cut off between 0.1 A and 0.2 A. The power bank is ideal for charging mobile devices, but won't be suitable for very low current draws.